Out of all my dessert recipes I love making the pumpkin recipes. I don’t know what it is about pumpkin or fall, but this one flavor tends to be my favorite. If I see it on the menu at a restaurant or have a chance to make it, I will. You will find many of my most loved recipes below that I have made. Enjoy these Fall Pumpkin Recipes and share them with friends. As summer comes to an end and the nights are getting cooler and longer, the kitchen starts heating up again. It’s a quick season going from Apple season to Pumpkin season. I think it’s all the spices that go into sweet pumpkin desserts that make it so enjoyable. What do you think? The scents of Fall and Pumpkin Spice are found everywhere. I guess it is like the candy cane peppermint of Christmas. The pumpkin craze lasts from September through December so you will have plenty of time to try each and every one of these fabulous recipes. Now it is up to you. Is fudge your downfall? How about fudgy brownies with spicy M & M’s in them? Are you a fan of the traditional like cute mini pumpkin pies or pumpkin popovers? Maybe you prefer the Delicious protein smoothie or gluten-free Pumpkin Pancakes. I promise there is something here for you to treasure. Get directions to make your own pumpkin spice here. Now that you know what you can make with Pumpkin Puree and Pumpkin spice using canned pumpkin, I thought you might want to know the easiest way to make sweet pumpkin recipes using fresh pumpkin puree. Get complete directions for pumpkin baking here. Check Back often as this list is never-ending. As long as there are still pumpkins there will be more sweet pumpkin recipes. If you made any of these sweet pumpkin recipes share this post on Pinterest and Facebook and leave me a comment. 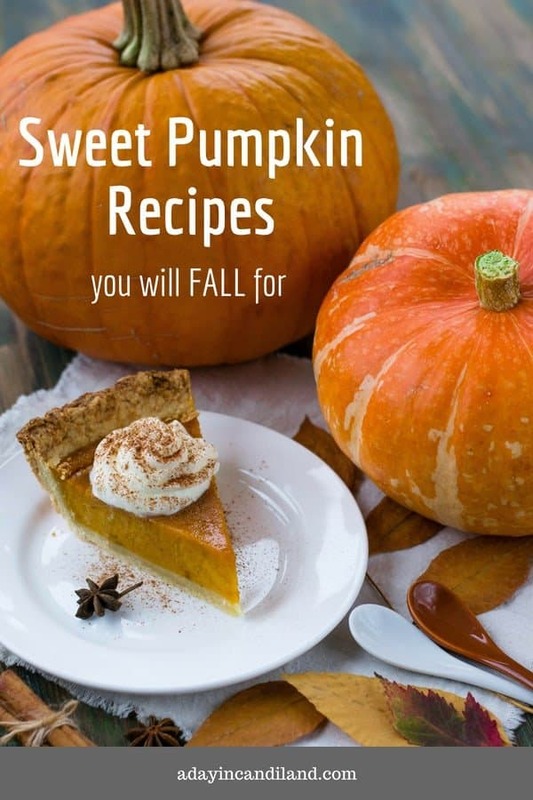 Enjoy Sweet Pumpkin Recipes you will Fall for September through December or Year Round.